First adopted in 1919 during the Weimar Republic, Germany's black, red, and gold make a striking combination for a national flag. They also happen to be the colors of Belgium's flag. A multitude of very small crystals, set by hand, make up the bead's shimmering pavé surface. Branded with "Swarovski Crystals' for authenticity, enjoy taking it with you as a little piece of home, or give it as a gift that captures precious travel memories. 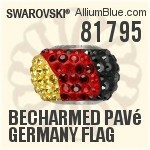 Swarovski 81795 BeCharmed Pavé Germany Flag consist of lead-free ADVANCED CRYSTAL by Swarovski.